Uploading over Serial is fine during development, when you have access to the Serial pins and the USB port. But once your project is finished, and you put it inside an enclosure, it not that easy to upload updates with bug fixes or new features. A solution to this problem is Over The Air updating, or OTA for short. As the name implies, this technology allows you to upload new code over Wi-Fi, instead of Serial. The following example is basically Blink Without Delay, but with the necessary OTA and Wi-Fi code added as well. Add your Wi-Fi credentials, and upload the sketch over Serial. Connect an LED (+ resistor) to pin 13. Then restart the IDE (you have to close all windows). 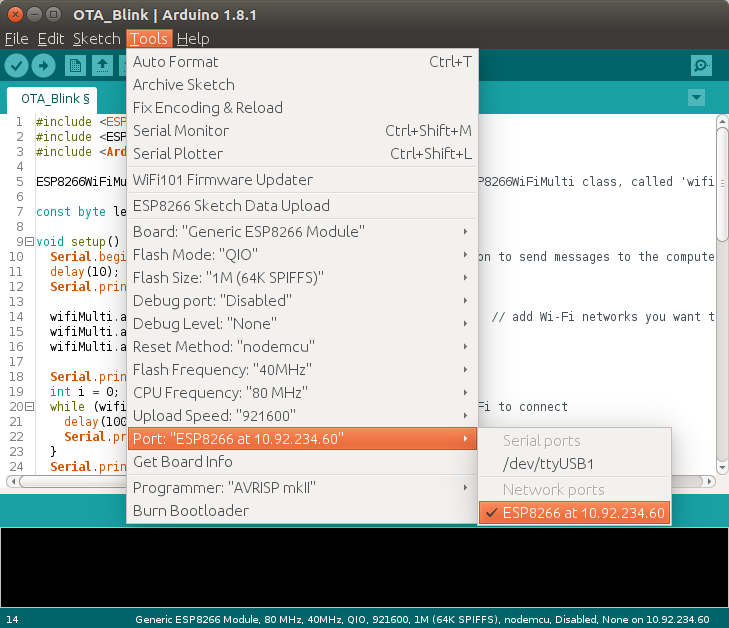 Go to Tools > Port, and you should get a new option: Network Ports: ESP8266 at 192.168.1.x. Select it. Next, change the interval on line 59 from 1000 to 500 milliseconds, and click upload. You should get a password prompt: enter "esp8266". This password is set on line 31, so you can change it if you want to. You can also delete line 31 altogether to use it without a password, but it's not recommended - for obvious security reasons. The sketch should upload just fine, and once the ESP has reset itself, the LED should blink twice as fast.
. If this happens, just enter the password, and try again. Using the Serial Monitor over Wi-Fi is not possible (yet?). When you try to open it, you'll be prompted a password, entering the password won't work, because there is no SSH support to access the ESP's console.